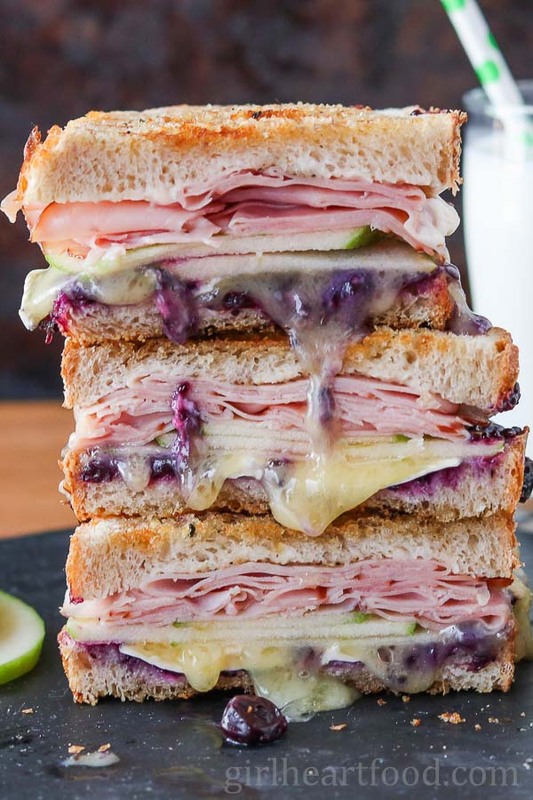 This Ham & Brie Grilled Cheese Sandwich is piled high with thinly sliced ham, creamy brie cheese, crispy granny smith apple and sweet blueberry jam for one scrumptious bite. Your belly is definitely gonna do a happy dance! This ain’t no ordinary sandwich, my friends. And, it definitely ain’t diet food. Nope. It’s straight up indulgent. It’s a ‘tastes-so-good-you’ll-wanna-slap-yo-momma‘ good. Or maybe make you break out in a happy dance in the middle of the kitchen. No? Just me? Food does all kinda funny things to me 😉 Ha! Most times I like to stick to the healthier side of things, but every once in a while I break loose and treat myself. I mean, if we can’t do that, then there’s something not right. Right? I love a good sandwich. Breakfast, lunch, dinner, you name it. I gotsta have cheese on my sandwich and this time I went all out with brie. First off, I love to smear butter on the outside of the sandwich to give a little flavour and to help with the grilling. A griddle pan is not required to make this grilled cheese sandwich recipe, but surely helps! Look at those marks! If you don’t have a cast iron griddle pan (like I’m using here) use a regular cast iron pan or non-stick pan. The heat should be on medium. You want the sandwich exterior to get all golden brown and crispy and for the cheese to get all oozy and melty. You don’t, however, want to burn your bread. P.S. I’m famous for burning bread. Like, it’s seriously a running joke in our home now. Don’t use just any old bread….use something flavourful and fresh. For this sandwich, I used sourdough. Speaking of bread, the size of the slices you choose will affect how much mayo and butter you use. I had some decent-sized slices of bread and what I used for this recipe was just right. I used a variation on my mixed berry chia seed jam and made blueberry chia seed jam for this sandwich, but you could use whatever type of jam rocks your boat. Thinly sliced or shaved ham works lovely in this recipe. Your deli should be able to slice it up for you. Don’t care for brie cheese? Camembert works lovely too! Hope you love this gourmet grilled cheese sandwich recipe as much as I do! Spread mayo on one side of each slice of bread. Distribute jam over top of only 2 of those slices. Sprinkle with a little black pepper. Top jam with cheese. Next, add apple slices and ham. Butter outside of all 4 bread slices. In a griddle pan or non stick pan on medium heat add sandwiches. Cook about 3-4 minutes per side, carefully flipping and cooking 3-4 minutes more until cheese is melted. Carefully remove from pan, cut in half (if desired) and enjoy! Don't use just any old bread....use something flavourful and fresh. For this sandwich, I used sourdough. Don't care for brie cheese? Camembert works lovely too! Previous Post: « Recipes & Self Care Ideas – Sunday Funday! OMG (i know what that means!) how did I miss this sandwich! Blueberry jam!!! This is brilliant. And it certainly photographs beautifullly! LOL!! Thank you so much, Mimi 🙂 Hope you’re having an awesome week! 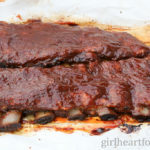 I am oh so in love with this recipe, Dawn! I haven’t indulged in a nice and fancy grown-up grilled cheese in a very, very long time. I’m overdue. I can’t wait to give this a whirl. Melty brie and fruit are such an amazing combo. this looks SO good! I love all the flavours you’ve got going on here it’s definitely my kind of sandwich! This is the best grilled cheese ever! All that cheese is making me want one before bed! Ham and brie are such a winning combo! Love the addition of blueberry preserves here too! Thank you very much, Lindsay 🙂 It really adds a nice little somethin’ somethin’. Dawn, how brilliantly epic is this grilled cheese sammie! I’ve tried dates in a grilled cheese – but never thought to add jam even though am a huge fan of that sweet+cheesey+savory combination of flavors between crusty fried bred! My daughter always smears her grilled cheese with butter before she sautes those slices – Ive gotta show her this as this one will surely become her fav! Swooning over the flavors in this sandwich, Dawn! And oh my that melty brie!! This one is an absolute must try! It definitely is 🙂 Thanks Marissa – you’re gonna love this one! This sandwich looks absolutely fantastic Dawn! 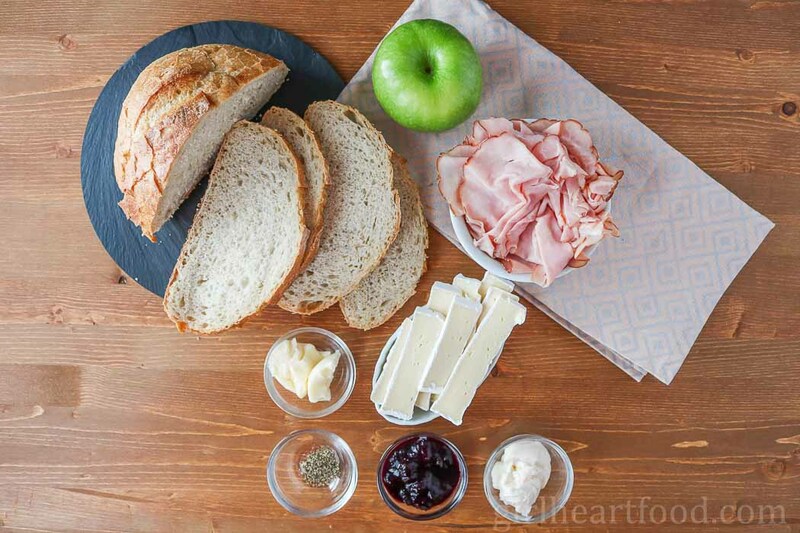 I love melted brie, and the pairing with apple and blueberry chia jam is perfection! I don’t often eat sandwiches but I’m having a serious craving for this one! Thanks very much, Leanne! It tastes it too 😉 I’m sure you’d really enjoy this one! Oh my goodness! All that oozy cheesy yumminess! This is a perfect grilled cheese sammy! Love the salty ham with cheese and fruit! You’ve made a winner here, Dawn! Killer grilled cheese sandwich Dawn! What an awesome idea to add the blueberry jam! Love it! Pinned and can’t wait to try! Dawn – this is totally my kind of sandwich. Indulgence is a good thing. It keeeps us on the “straight and narrow” the rest of the time, don’t you think? Makes me want to rethink the dinner plans here. I love the sweet/salty/creamy/crunchy mix! Pinning! Looks absolutely delicious!!! Such an amazing recipe! I would look at the brie dripping on the side of the sandwich all day if I could. But there is no such chance – won’t really be able to stop myself from eating it all. Fast. And in the presence of blueberry jam and pepper, mmm. GIRL! You’re killing me with that cheese melting down the sandwich. Holy cow, does anything make me hungrier than melty cheese? I really don’t think so! And I love that you included apple here. Apples are so good in savory food and I just don’t see them used that way enough! You weren’t kidding when you said gourmet grilled sandwich, Dawn! This looks incredible. I love playing around with grilled cheese ingredients, but I don’t think I’ve ever tried a brie or camembert. I love both styles, but I typically just slice ’em and eat ’em with fresh, chewy Italian bread. Now I need to rethink that…or at least buy extra so that I can make these sammiches sometime soon! These bad boys are right up my alley.